Celebrate the 10th birthday of an icon with this limited-run beauty. 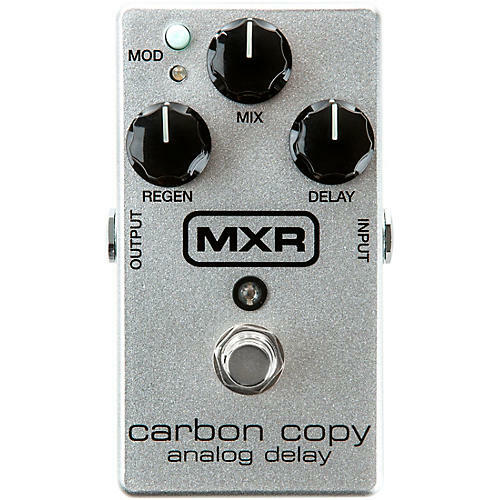 In the 10 years since its release, the MXR Carbon Copy Analog Delay has become a rock ‘n’ roll staple. Its rich bucket-brigade warmth, elegant simplicity, and healthy reserve of delay time have endeared it to guitar players around the world—weekend warriors and recording pros alike. The universal appeal of the Carbon Copy Delay is evident in the wide range of artists who’ve had it on their boards—from legendary rock ‘n’ rollers such as Joe Perry and the Edge to jazz maestros such as Al Di Meola to heavy riffers such as Matt Pike and modern fretboard wizards such as Tosin Abasi. This pedal has become the go-to standard for any player who wants a well-rounded, easy-to-use delay that sounds incredible.